Fake Natoo is a brand from mainland China. In an industry where imports from China are all pervasive, original designs and designers are yet to make their mark in the global market. Fake Natoo, is one such brand, not just designing an intriguing and well designed collection, but also combining sustainability. Na Zhang, a Beijing native from Canada, the designer behind Fake Natoo, works with discarded clothing and textile donations, to create greater value from unwanted materials. Zhang’s reincarnated designs incorporate dozens of garments, re-coordinated into stylish unexpected proportions and combinations to create a sophisticated and fashion forward collection. Exploring the connection between people, dress and the environment through the collection. The project undertaken by Zhang is called the Re-clothing Bank, and is a response to the rapid pace of development in China, where the old is all too quickly discarded and replaced. According to Zhang, “Old clothes hold traces of people’s lives, of humanity. I hope that wearing redesigned old clothes can make people pause and contemplate their present and future.” Supplying their cooperatives with garments that thrift shops cant sell, the clothes are cut into patches and turned into new designs, and resold in Zhang’s Brandnu shop in Beijing. 10% of profits return to the migrant women’s cooperatives that produce the designs. Zhang, otherwise known as LaLa, got into the upcycling business to help generate jobs for migrant women in Beijing. “I didn’t even know there was such a word as ‘upcycling’,” says Zhang, 40, a fashion design professor from Raffles Design Institute Beijing told me that’s what I was doing without knowing it. Although upcyling wasted textiles and second hand garments has long had traction in the global sustainable fashion market, it is a much newer and more exotic concept in China. Redress for example, an NGO that promotes sustainability in the fashion industry, only has a dozen names on its Chinese upcycling database. Italian label Giulia Rien a Mettre, founded by Italian born Giulia Mazzer, create a unique women’s wear collection with a quirky, off kilter design aesthetic. Lemuria specialize in polymorphic clothing, with a full range of adaptable tops, dresses and even pant/skirts, with options that range from short to long voluminous and fitted, and even sleeveless, strapless, short sleeved and long sleeved all in a single garment. Stewart and Brown produce a quirky, wearable collection full of life, layers, textures, muted colors, lengths and asymmetries, with a very Parisian sense of style; the kind of easy wear, yet stylish comfort that Parisians achieve so effortlessly. Inspired by the colors, sights, sounds and tastes of different countries and cultures, and shaped by her work as a vogue editor, Lilly Marthe creates a beautiful handmade collection. With a focus on rich, elemental colors and textures, all the pieces in the collection are exquisitely hand-crafted, with a single piece taking a master knitter as much as forty hours to complete. 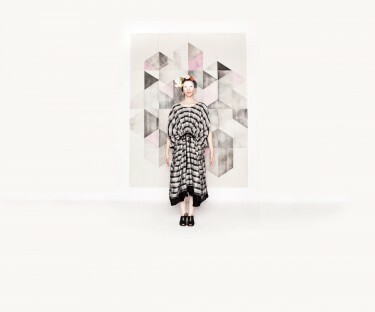 Frei merges design, comfort and sustainability to produce a beautiful, ethereal and whimsical collection of great beauty, through intriguing and clever cutting, Zen-like print and plain combinations, and understated color coordinates. 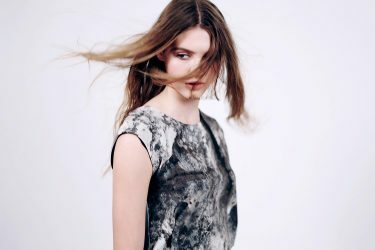 London eco fashion brand PARTIMI, was founded by Central Saint Martins graduate, Eleanor Dorrien-Smith. Partimi presented their first full collection at Estethica, London Fashion Week’s eco fashion trade show, with the presentation of their spring summer 2011 collection.